HempTrain™ Advanced Hemp Decorticator FAQ – Canadian Greenfield Technologies Corp.
Find answers to frequently asked questions about the HempTrain™ Advanced Hemp Decorticator. How does HempTrain™ differ from conventional decorticators? Conventional decorticators employ a hammer mill or a hammer mill-like mechanism, which uses a beating action to separate bast fiber from hurd. This action damages bast fiber and causes attrition to both fiber and hurd, which leads to significant loses as dust (25-40%). Damage to bast fiber destroys the structural integrity of the fiber bundles required for reinforcement applications. Attrition of hurd leads to production of powdered hurd, contaminating the CBD-rich green microfiber; making any separation of clean CBD-rich green mass impossible. The HempTrain™ Advanced Hemp Decorticator employs high speed kinematic action to separate hemp feedstock into three separate streams; producing intact structural bast fiber, size-specified hurd, and clean green microfiber, rich in CBD and other bio-nutrients. Why do I need a HempTrain™ Advanced Hemp Decorticator for my hemp farm/business venture? In order to implement alternative revenue streams, the hemp industry requires technological infrastructure to convert hemp crops into feedstock for high value markets, domestically and abroad. Currently, there is a technological infrastructure gap prohibiting hemp farmers from reaching high value markets. 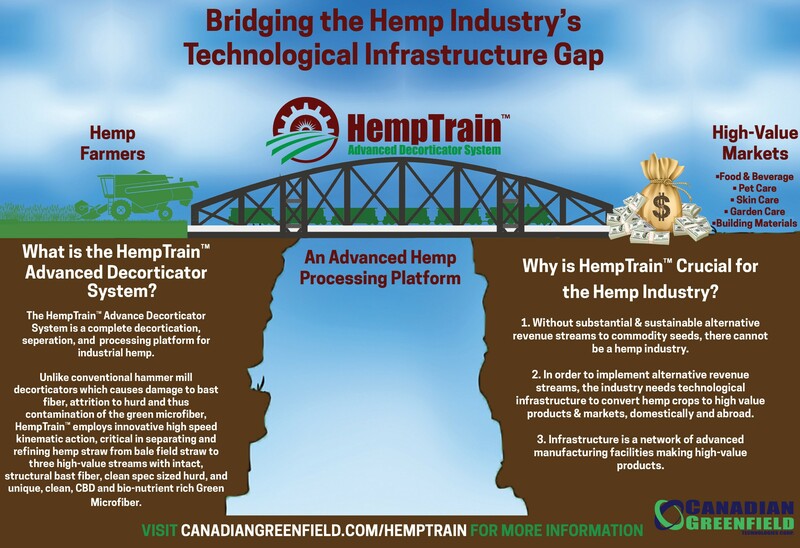 HempTrain™ bridges this infrastructure gap, giving farmers the opportunity to obtain substantial and sustainable revenue streams; without alternative revenue streams to commodity seeds, there cannot be a hemp industry. HempTrain™ is the ONLY hemp processing technology offering businesses immediate access to the CBD market. What is included in the HempTrain™ Advanced Hemp Decorticator turn-key facility package? The commercial HempTrain™ module includes a bale opener, processing units, dust collection, electrical & control and 2 years of limited warranty. The turn-key package also includes delivery, installation, commissioning, and equipment training. HempTrain™ is currently only available to Canada and the United States. What is the estimate lead time for a HempTrain™ installation on my premises? Due to batch manufacturing, delivery and installation is dependent on when the order is placed. Please contact us for more information. Where is the HempTrain™ Advanced Hemp Decorticator manufactured? HempTrain™ is engineered and fabricated at our facilities in Calgary, Alberta, Canada. All parts are sourced from Canada and the United States. Can I see the HempTrain™ Advanced Hemp Decorticator operate? Yes! Our Calgary, Alberta HempTrain™ facility is available for viewing. Please contact us to schedule your facility tour today. Green microfiber is the unique third stream of biomass produced by HempTrain™. Green microfiber is rich in CBD, protein, carbohydrates, dietary fibre, and other natural bio-nutrients including terpenes, lignin, glucose, hemi-cellulose and pectin. As a result of the unique high speed kinematic action HempTrain™ employs, HempTrain™ is the only hemp decorticator capable of producing this CBD-rich stream. Can the HempTrain™ Advanced Hemp Decorticator process other crops such as flax, juke, and corn, etc.? HempTrain™ has been specifically engineered to be a complete production platform for industrial hemp. What is the throughput capacity? How much facility space is needed to install a HempTrain™ Advanced Hemp Decorticator? With the room required for equipment access and a forklift to load hemp bales and remove product, ~3000 ft 2 should be allocated for the HempTrain™. What bale size is compatible with HempTrain™? HempTrain™ is capable of processing both round and square hemp bales, up to an 8’ x 5’ x 6’ volume (2.4m x 1.6m x 1.8m). What is the electrical supply needed? How much waste does HempTrain™ produce? Almost none! Unlike hammer mills and field decorticators, HempTrain™ effectively converts 100% of hemp feedstock into three high value product streams; long structural bast fiber, size-specified hurd and CBD-rich green microfiber. Our high kinematic decortication technology maintains the integrity of each stream, to better enable whole plant utilization. How much dust does HempTrain™ generate? Almost none! The HempTrain™ Advanced Hemp Decorticator System’s clean, streamlined production train efficiently separates baled hemp into three high value streams with no appreciable dust generation. Conventional decorticators employ a hammer mill “beating” mechanism to separate bast fiber from hurd, generating 25-40%dust during the hammering action. This dust further contaminates the CBD-rich green microfiber stream, making a clean separation impossible. Furthermore, HempTrain™ is equipped with an advanced dust collection system capturing these low quantities, leading to a cleaner, uncontaminated operation. Is the HempTrain™ Advanced Hemp Decorticator energy efficient? Yes! Due to the high-speed kinematic action employed by our decortication technology, the HempTrain™ Advanced Hemp Decorticator uses no more that 60HP (50kW) at peak. 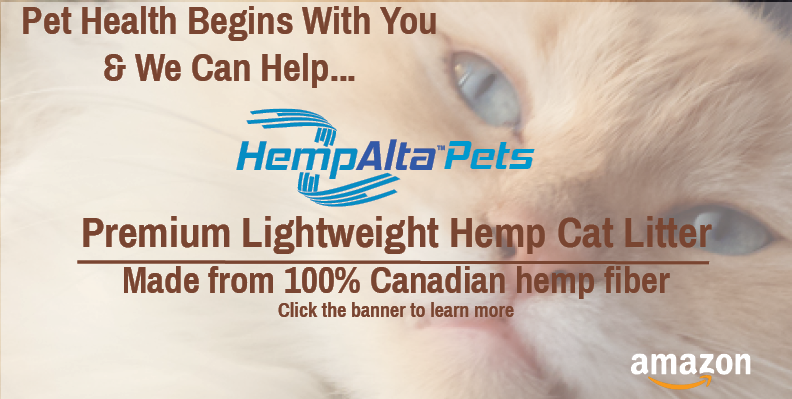 This makes it the most energy efficient hemp processing platform available. Can HempTrain™ be placed on a trailer for field operation? No, HempTrain™ is a complete hemp processing facility, intended for a stationary installation. How many operators are required to operate HempTrain™? Only one operator is needed to operator HempTrain™ efficiently. It is required by law in Canada that a minimum of two operators are required on the premises to operate heavy machinery. Please consult with your local labour laws. Watch the video above to learn how the HempTrain™ Advanced Hemp Decorticator operates. Ready to schedule your HempTrain™ Facility Tour?